Handcrafted Sequinned pillow. Base layer of pale gold sequins covered by second layer of Bordeaux, dark rose, coral and green sequins. Hand embroidered in diagonal formation. Copper yarn visible on top layer of sequins. Hand crafted Set of three appliqué pillows hand embroidered appliqué, ribbon and beadwork. Satin appliqué on velvet ground. Organza ribbon and metallic beads on velvet ground. Handcrafted pillow hand embroidered silk thread work, ribbon and beadwork. Embroidered on velvet ground. Organza ribbon, silk yarn and metallic beads on velvet ground. Pair of rectangular throw pillows with hand embroidery on fronts and contrasting silk Ikat on backs Designed by Michelle Nussbaumer. 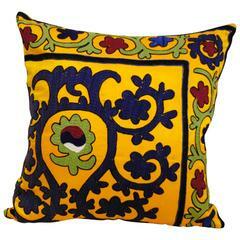 Beautiful pillow made of hand embroidery silk on cream color cotton background, of flowers and vine motifs. Cotton baking with zipper, Fresh new insert. Beautiful pillow made of hand embroidery silk on cream color cotton background, flowers and vine motifs ,cotton backing with zipper, fresh new insert. Vintage Turkish pillow hand embroidered in wool on woven jute fabric. Cotton backing with zippered closure.